Take the Aurora Winter Train between Anchorage and Fairbanks for an unforgettable journey across this land of aurora borealis, arctic blue skies and Denali. The Aurora Winter Train travels northbound on Saturdays, departing Anchorage at 8:30am, arriving in Fairbanks at 7:45pm. And it returns southbound on Sundays, leaving Fairbanks at 8:30am and arriving at 7:45pm in Anchorage. The weekend rail-fly option covers miles of snow-blanketed landscape. Extend your stay in Fairbanks and go on a guided winter journey by land or air across the Arctic Circle. Travel north by day to experience Alaska's Arctic and south by night to scan the northern skies for the amazing Aurora. Or add on a day trip or overnight at nearby Chena Hot Springs Resort for a good mineral soak, just 60 miles from Fairbanks. Visit the Aurora Ice Museum, the largest year-round ice environment in the world created from over 1,000 tons of ice and snow. The ice structure is created from over 1,000 tons of ice and snow, all harvested at Chena Hot Springs. Climb an Ice Tower, curl up in a Polar Bear Bed, watch a game of life size chess, or pull up a stool at the Stoli Ice Bar and have a martini poured through a sculpted ice fish into your very own sculpted ice glass. In Anchorage, enjoy world-class museums, dining and culture. 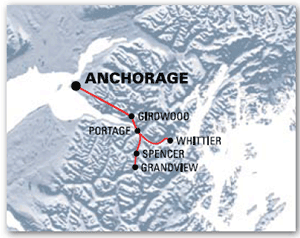 Includes: One-way rail between Anchorage and Fairbanks, Fairbanks hotel and return airfare. Transfers are included. Package prices may vary from the published rates with hotel, tour selections and date of travel. All prices are subject to change without notice. To book this or any winter vacation package, please call our friendly and helpful reservation agents at 800-544-0552 if you are outside Alaska, or within Alaska 907-265-2494. Hearing impaired please call 907-265-2620.